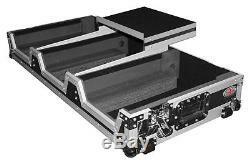 ProX XS-CDM2000WLT Flight Case w/ Laptop Shelf + Wheels for Pioneer DJM 900/CDJ 2000. Condition: BRAND NEW IN ORIGINAL PACKAGING. The ProX XS-CDM2000-WLT is the perfect companion for the state-of-the-art digital DJ. Built with top grade heavy-duty materials, the XS-CDM2000WLT gives you maximum durability, dependability, and security. 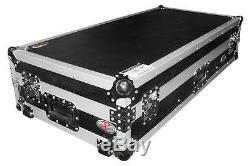 This large format digital turntable coffin case is constructed with premium Series laminated plywood to protect your investment at all times. For added protection, this item is equipped with steel heavy duty ball corners to withstand the rigorous travel that Pro-DJs demands. Silver construction and a modern stage wood design will turn heads and blend with the decor of any venue. The Sliding Laptop Shelf and adjustable foam inserts make everything accessible, secure and convenient. The XS-CDM2000-WLT has it all. You will definitely be satisfied with this top of the line product from the signature series line of products from ProX. The XS-CDM2000-WLT is constructed with our rugged signature 3/8 Gig-Ready Series Plywood, durable rubber wheels, reinforced steel ball corners, as well as recessed steel padded handles and latches. This ProX case is manufactured with our exclusive Honey Comb laminated surface Design. Made with the super-sleek look of Honey Comb hexagon grids on all shell surfaces, which gives the cases an almost alien look! Also, as opposed to regular laminated plywood cases from other manufacturers, the ProX Honey Comb design helps prevent minor to mild scratches. The Honey Comb Digital line design was inspired by the design of New York City Street Manhole covers which are made to handle rough and tough everyday punishment. All ProX cases during the manufacturing process use CNC technology to assure all cases are consistently built with strict specifications that are required for the high-quality standards that ProX cases is known for since 1984. For the safety of your equipment, do not attempt to transport with any gear not properly loaded into the case. Standard Style, Silver trim on Black Digital honey Comb exterior design. High-density foam interior support & casing. Recessed spring action Handles per Side. Heavy and powerful steel ball corners. Signature Series Certified Laminated Gig ready 3/8 plywood. Industrial Recessed butterfly twist lock latches that can be padlocked. Access hole with removable emblem cover. Includes multiple pieces of adjustable foam to ensure the correct fit. Heavy duty low profile caster wheels. Product Dimensions (L x W x H): 43" x 21" x 10 inches. Fits DJ Mixer models Pioneer DJM 900, and Nexus CDJ 2000, and similar hardware. To replace the item for a brand new one. All replacements and exchanges are free. This includes blown speakers with burned voice coils. The item "ProX XS-CDM2000WLT Flight Case withLaptop Shelf+Wheels 4 Pioneer DJM 900/CDJ 2000" is in sale since Tuesday, October 30, 2018. This item is in the category "Musical Instruments & Gear\Pro Audio Equipment\Cases, Racks & Bags".